Â TNA leader Uhuru Kenyatta must be watching with keen interest when HAMAS- a designated terrorist organization- finally managed to gain international attention from its altercation with Israel. This is because, HAMAS is a sanctioned and isolated organization in charge of the Palestinian Authority, and Uhuru too would face a similar predicament if elected president come March 2013- head of a cash strapped, isolated and sanctioned regime. Hamas was recently accused of using human shields by launching rockets to Israel from densely populated areas that Israeli airstrikes could not hit for fear of civilian casualties. Now thereâ€™s no difference between using human shields with what Uhuru intends to do when he decides to hold Kenyans ransom by pursuing the presidency â€œAgainst Medical Adviceâ€. The jury is out, â€œdoctorsâ€ privy to international political dynamics are unanimous that â€œUhurunemiaâ€ would kill Kenya even before his case is disposed of at The Hague. That is why Kenyans are being duped into being human shields of an ICC accused president if TNA were to take power. Using Kenyans as human shields is analogous to the strategy Uhuru is planning to employ if in power when he knows very well that world powers, when they retaliate, would impose sanctions that would bring starvation, homelessness, and joblessness unto Kenyans. Uhuru already started using it, by having the ICC case set to start after the elections, because they used an election date for Kenyans as an excuse. Their excuse was that â€œKenyans would be disenfranchised if they are not on the ballotâ€. No they wonâ€™t! On the contrary they would be guaranteed of stability if Uhuru is NOT on the ballot. Uhuru didnâ€™t care to inconvenience Muthaura who is bored of waiting for his judgment day. UK doesnâ€™t give a damn about the small fish of this country. Now let me tell Kenyans the stuff responsible leaders are made of. Responsible leaders are willing to stand in the way of the bullets for the sake of their own people, by giving up their ambitions if that is what it would take to guarantee Kenyans stability and progress. That is what Dedan Kimathi, Tom Mboya, Pio Gama Pinto did. They did not use the Kenyan poor and children as human shields. Like men, they chose to let the bullets rain on their own flesh. Going down like a man is what I call it. But Uhuru certainly wants innocent, shoeless jiggered boy and girl-child who wear nguo iko na kiraka to school to take his ICC bullets. He wants them to be his sacrificial lamb when he doesnâ€™t give a damn if sanctions would make their lives worse that what it is right now. Uhuru wants the poor, the hungry kids, the sick, the jobless to entangle themselves with his ICC predicament. To be confined to 5-10 years of misery and poverty because he wants his problems to be their problems. That is using people as human shields, not any different from holding a child in front of you when being pursued in a shoot-out by the police. That is why hungry Kenyan children have to be more scared because the already suffering will suffer more under TNA. If itâ€™s about Kibaki being succeeded by his tribesmen, for heavenâ€™s sake, why not give us Peter Kenneth who is more able, unifying, qualified, cleaner and less polarizing figure? Uhuru itâ€™s not about your tribe, itâ€™s about the pain of your presidency. That because you share a last name with the founding father your destiny is intertwined with Kenyaâ€™s. No its not! Leave Jomoâ€™s legacy out of this. That if you go down, Kenya too has to sink. No it shouldnâ€™t. Where you are accused of â€œcircumcising innocent men without anesthesia, and then leaving them for the deadâ€, just carry your own cross and we shall with pride haul our burdens of poverty. Uhuru doesnâ€™t care about the Kenyan sick, the hungry kids, and the suffering jobless millions- those who carry brown envelopes in the streets of Nairobi when he insists on running. Legally he might be justified, but morally UK is on the wrong side of History. "Responsible leaders are willing to stand in the way of the bullets for the sake of their own people". The question every Kenyan should ask is: "What agenda does he have for the nation?" Whipping tribal emotions using ICC is not only baseless but also dangerous for peace and unity. Ungemwambia tena kwa karibu, Murata Wanyu; hayo macho yanaungua. Sikujua kwamba hiyo ni kazi ya bangi nyingi. This post borders on the flimsy and is anecdotal. this is mob justice pyschology where the suspects are offered lynching without the benefit of a hearing. I don't like Uhuru Kenyatta but that should not blur my vision at the altar of expedience to sacrifice him for fear of unknown or hate of heredity……lets put himin or out of office on merits of his integrity or lack of it but not fear mongering……its utterly stupid for lack of any appropriate alternative word. We eng.,unatumia masaa mangapi kuandika haya maneno magumu hivi? Onsongo, do u want the nation to be governed by a convicted felon? That is what will happen if UK is convicted and jailed, then we have to do a by-election on tax-payer money. Hamas is sanctioned, has had airstrikes, is cashstrapped. Thats the exact siutation UK would face as prez. Kenya would be under sanctions. There’s not a party or movement I know that is like TNA in terms of challenges. Mhandisi, I think it is you who is anecdotal and flimsy. The post does not at all judge Uhuru, indeed does not suggest that Uhuru is guilty. NO. The post is however alive to the fact that Uhuru is suspect in court of law, a court domesticated by our own parliament. That is why he stepped down as a minister. That is what our constitution prescribed for this circumstance. A constitution Uhuru himself participated in negotiating and indeed voted YES for. Now the question, how can you be a president in the same government where you can't be a minister? Do you think that cheating Uhuru is of any interest to him? What is the implication of a person who disregards the same law he subscribes to. Who is doing the lynching? Let us take a scenario, where eventually Uhuru is found guilty and convicted when in office? Do you believe that this won't be a case of another Bashir-a fugitive president! Is this what Kenya deserve? Is this your perception of patriotism Mhandisi? 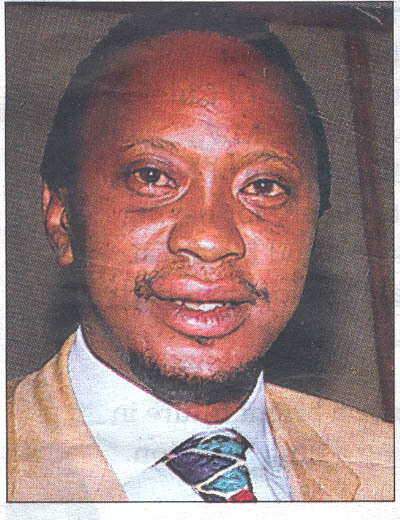 By campaigning and selling himself for the presidency, isn't Uhuru mobilizing Kenyans to lynch the constitution? I agree with the poster "A good leader is a patriot, a nationalist, a person who has the best interest of this country foremost, a person who is proud of the beauty of this country and its beautiful law abiding people," Uhuru fits this bill simply by respecting and protecting the constitution of this country. I personally know that Uhuru is Kenyan with the same right-albeit with the same constitutional obligations. If and when his court case is over, and he is found to be innocent, I can assure that the Kenyans who believe in his ideals and recognise him as a leader will vote him. His potential as a leader of this nation is however hinged on his humility to this GREAT NATION. UK is determined to see this country fall on its knees. This is selfishness of the highest order. Whether we like it or not Uhuru’s popurality is growing bigger each new dawn and if he’s the Gods annointed one nothing will prevent him from succeeding Kibaki. what's with all the fuzz, let him run and don't vote him. I've never liked the men since, I don't know why but I feel mistrust in his words. I agree 100%. UK is the wrong man for our beloved Nation Kenya. Kenyans need to do whatever it takes to vote against UK coz his legacy doesn't reflect the Kenyan interests. Well said, wish all Kenyans of sound mind could read this and comprehend. Further wish this could be translated into Swahili paragraphs pple could understand. Let us not kill our beloved Kenya by electing questionable leaders. Kenyas please wake up and let us face this issue with a lot of cern and with sober mind. Above all I like the photo herein above! Pity for those who think their views and comments against others wil change people minds.We Should pray to God to help us get a good president. Let the people decide. Why deprive people democracy. Stop worrying about sanctions for Kenya if would never happen even if @ Uhuru Muigai Kenyatta and @William samoei Ruto won the presidency and vice respectively. America cannot afford to sanction Kenya we are their only friends in Africa and so strategically located for uncle SAM to dare poke us its just scare mongering besides by the time Obama exists the white house America will be such a disaster it will have no power economicallyâ€¦â€¦so i donâ€™t know.who filed this sanction.in.your heads Europe cant sanction any country anymore they just cant afford it remember sanctions = to lost business Europe is in an economic mud hole soon they just wont play along with uncle SAM he drove them into a tadpole pool with the longest most expensive war in Iraq the reason that no one wants to touch Syria its to damn expensive they cant sanction Kenya they need. a partner to help police east and central Africa from Islamic fundamentalist and communist interests from an advancing china and mutual enemy Russia they cant dare leave such a country like Kenya unguardedâ€¦.so all this mumbo jumbo is nonsense ICC doesnâ€™t hold much sway anymore and the Americans know that so they dont care who gets the top sit if its Ruto or Uhuru or even Raila they will circumvent their stand and work with whomever,carol can write a whole bunch of crap here but her blonde mind doesnâ€™t see the bigger.picture what is at stake here is not a country its a global stability. economically so how ever small or monumental a country is no sanctions will be placed in the next decadeâ€¦.because every player is now important and the next 100 years is what is being focusedâ€¦. so keep to talk [email protected] Caroline @Rashidi Wanjala donâ€™t look for new fun base with myopic views if you cant add 1+100.shut up en listen thenâ€¦.it might save you future embarrassments among the illuminated who see a paradoxical personality in you mmmmmphh!!!!!! With friends like these, does Uhuru need enemies – Tanzania is a fit and proper friend of America ready and willing to take Kenya’s much vaunted place as America’s best friend in this region (let me repeat READY AND WILLING). They have everything Kenya offers as a friend to either America or Europe…and then some, ie stability etc…Do not expect Tanzania to tell us when we are messing up because they benefit in the end…WAKE UP!! Don’t forget that these countries use war and conflict as economic revival strategies and will be more than willing to take Kenya and smash it to pieces as they did Ivory Coast, Libya and even Somali (where they are using Kenya to do their dirty work)..again i say WAKE UP!!! I pity Kenyans who think uhuru deserves to run for the presidency. Only fools can belief a man who forced his case to delay so that the evidence against him is not made before he garners votes that would allow him to play this ransom game hamas style perfectly. If he were clean, he would have let the judges to decide his case earlier to reassure those losing confidence in him so that he gets their votes as well but alas! Uhuru knows once the case unfolds, it will kill his credibility and demonstrate the inhumane animal like dracula image which will dislodge all those who thought he is a demi god. with lots of respect uhuru and ruto taking on power is like throwing away the new constitution that we must implement at all costs.have kenyans who voted and championed for the new order/arevolution through constitution change forgotten that william ruto was and will never let the news laws see the light of the day as uhuru was among those who voted for the new laws as amatter of conveniency? It is unfortunate that at this time of age of our country ,there exist an idiot who can write so foolish words. please don,t let us jubilee group by saying at you step a side for somebody who has no vision of leadership in our country. you are a man tosha to take over from kibaki. Don.t worry of ICC hiyo si hoja, we know that next prezo ni UHURU MWIGAI KENYATTA TOSHA. Tell Mudavadi to join mbasi which needs a driver, And he must wait till 2023 after your 2 terms. we very well know who posts these lies to the internet, they are just a handful tribal men, paid to do it by the main PEV perpetrator from we know where. This is a shame on them…. Who will save Kenyans from this tribal moster within them? i think the task of electing leaders remain the duty of kenyans and no amount of pressure will stop uk from becoming the next president.we will vote for him man to man. These people who are discrediting kenyatta on baseless, invalid and inconsistent inexactids should stop their paranoid approach to the real facts and admit that we know who said these words “…if thy go ahead and announce Kibaki as the president of Kenya,…..there will be grave consequences…” Whoever said these words and actually called for mass action should be the man at the hague because he is the real cause of the pain, suffering, anguish and misery that kenyans experienced after the elections.